Do you want to learn Kriol? 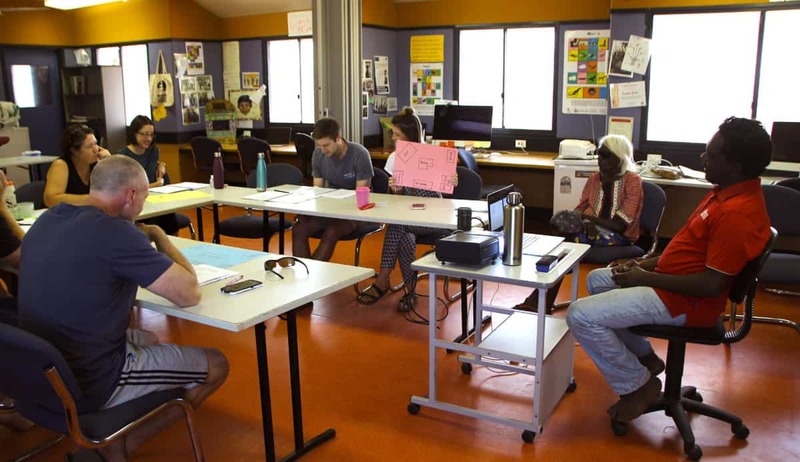 Ngukurr Language Centre will be running our next Kriol Awareness Course on the weekend of the 23rd and 24th of February. Bla mela Kriol Kos garra bi bambai! Yu gin len lilbit bla Kriol langgus en bla blakbala koltja la Ropa eriya. If yu wek eniwe yu gin irrim blakbala toktokbat Kriol, dis kos im gudeswan bla yu. Det titja ma garra bi Kriol spika ekspet ma burrum Ropa garrim linggwis ekspet du! If yu intristing bla faindat mo bla mela kos, yu jendi imeil o kol la mela! Kriol Awareness Course coming up! Our Kriol Awareness Course is coming up soon! You can learn a bit about Kriol language and culture from the Ngukurr area. If you work anywhere where you can hear people talking Kriol, this course is perfect for you. Your teachers will be expert Kriol speakers from Ngukurr, with some linguist experts too! If you’re interested in finding out more about our course, send us an email or call us! If you are looking for more information, please get in touch and we will respond as soon as we can.